A large part of the automotive build process lies in the search. We scour classifieds, dig through boxes of parts, and roam junkyards looking for that thing that strikes us as "just right". Each one of us has an image in our heads of the perfect car and it constantly infiltrates our daydreams. For some it's a sleek black VIP car with flat lipped wheels cambered into radiused fenders. For others it's a bright colored sports car sitting over lightweight track wheels and sticky rubber. Ranging from wild and flashy builds to conservative and meticulous projects, we all strive for this dream car that cruises through our thoughts each day. As soon as he witnessed the lines of the boxy and flared BMW E30 M3, Greg Strube knew that he had to get his hands on one and the search began. For four months, Greg found himself engulfed in classified ads in search of the "right" E30 M3. The search ended when Greg stumbled upon one for sale on a forum that he frequented. 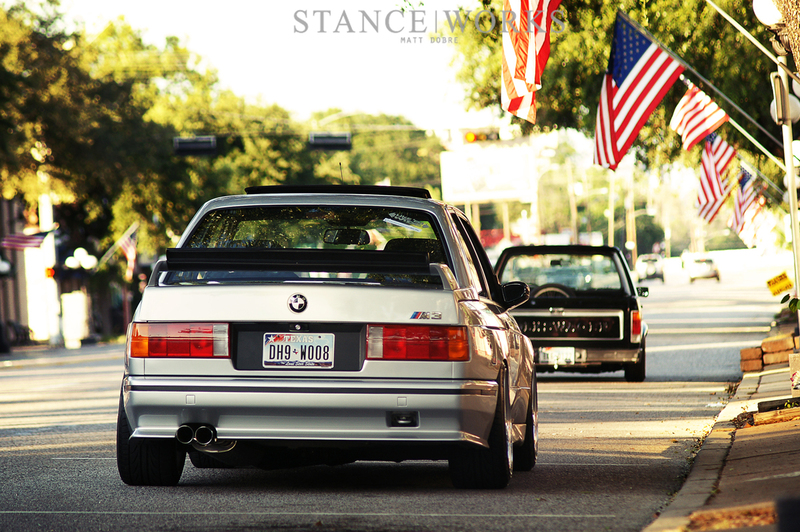 Before he knew it, he was on the road heading back from Dallas to his home in Houston, riding in his newly acquired BMW E30 M3. He was too excited to pay attention to the lack of Air Conditioner, even in the Texas heat. He had found the right car. Finding the right car provides closure to one search but it opens the door to countless ventures ahead. As soon as our new car finds its way into our garages or parking spots, we're off looking for the perfect parts to complete the build. 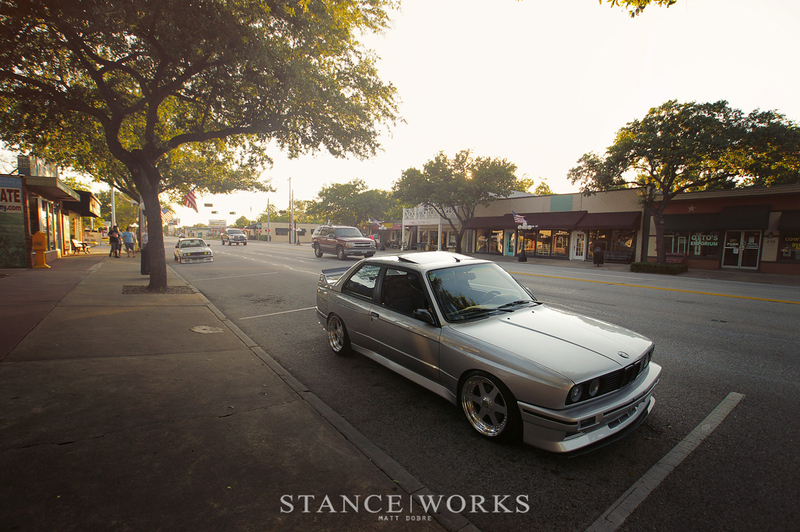 Greg's love for the BMW E30 M3 was forged from a reverence for the track inspired fender lines and simple box design that defines the classic BMW. He was not interested in drastically changing the car, but rather accentuating and building upon the beauty that rolled off the BMW assembly line. 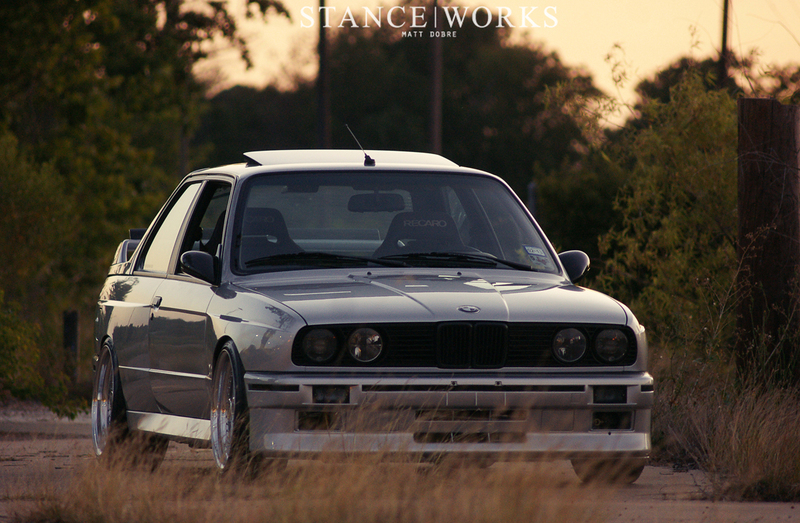 His BMW has retained a very OEM apperance, but don't let it fool you. Greg has gotten his hands dirty altering every facet of the car. One of the most definitive aspects of a car's appearance lies in the wheel choice. We're all familiar with the trials and tribulations of finding the right set of wheels. Bolt patterns, offsets, widths, style, and uniqueness all need to come together in harmony to ensure the perfect set of wheels to accent a build. Greg was wandering around a wheel resale shop with his buddy and fellow E30 owner, Marque Marquez, when they happened upon a set of HRE 506's at the very back of a huge wheel rack. They were only 17x8 and they were in pretty rough shape, but Greg couldn't pass up such a unique and rare set of wheels. The 8 inch width wouldn't suffice for the fitment that he had in mind, so the HRE 506 wheels found their way home back to the HRE facility in Southern California where they were professionally refinished and widened by the company that had manufactured them years prior. The wheels made their way back into Greg's hand with a fresh polish and coat of paint, now measuring in at 8.5 and 9.5 inches wide. 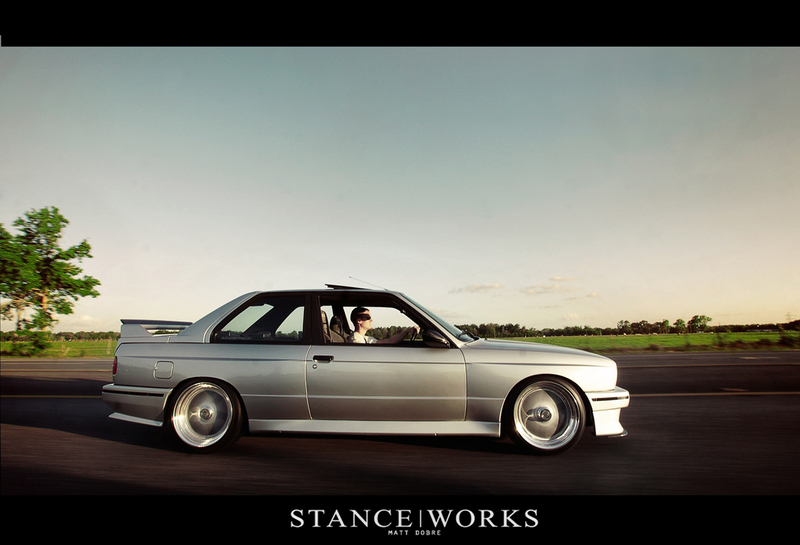 Wrapped in mildly stretched Falken tires, the HREs sit right at the edge of the infamous E30 box flares. Their simple design and hard edges are the perfect compliment to the lines sketched out by BMW's lead designers. Greg found the right set of wheels. Greg is most proud of what lies beneath the hood, and he has every right to be. 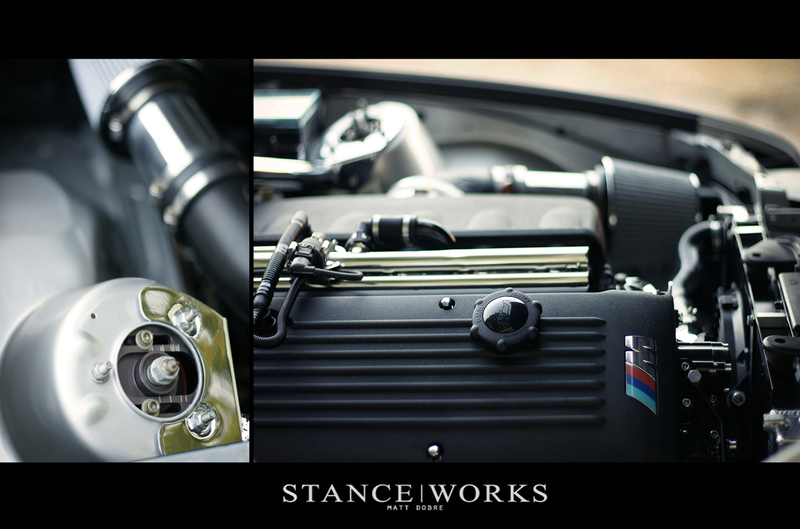 The E30 M3's S14 engine is more than capable and it offers a great canvas for the tuners out there, but Greg wanted something more. In his typical fashion, Greg wanted something custom but he didn't want to strive too far from the original styling. The answer was an S54 from the later BMW E46 M3. To maintain the original dynamics of the engine, Greg opted to incorporate the original E46 6-Speed transmission, ECU, Vanos, and drive-by-wire into the swap. All of the work was undertaken by Greg and his friend in the garage of his very tolerant girlfriend (it comes as no surprise that he now proudly calls her his fiance). It wasn't enough to just swap in a new ///M engine, Greg wanted to ensure that the presentation was up to snuff with the rest of the build. They busted out the welder and shaved the holes left from the dismissal of the S14 and went to work cleaning up the bay. The ABS unit found its way under the front fender while the brake lines were re-routed to their new home. The end result is an OEM+ engine bay that maintains the cleanliness of a factory product but houses an updated ///M power train. 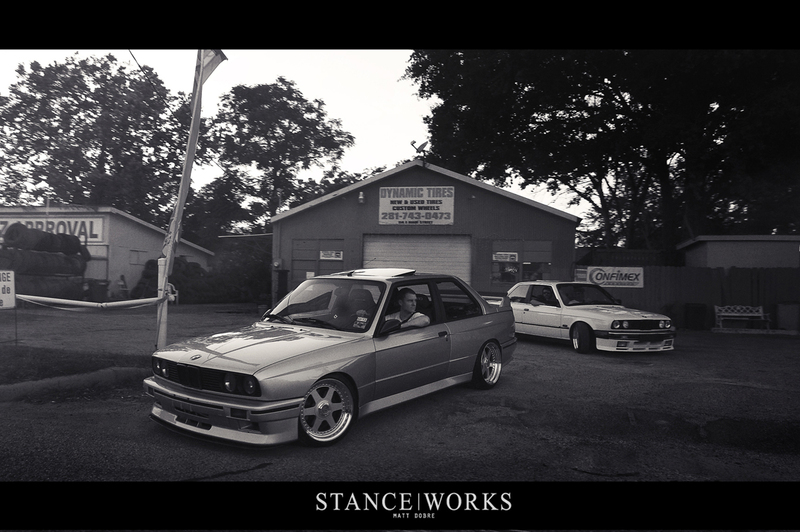 Everyone has a different definition of the "right" look for their cars, but it's the motivation, passion, and determination behind the journey of a build that StanceWorks celebrates in these articles. Greg Strube's goal was to preserve the lines and character and lines of the car he had fallen in love with while adding his own subtle touches throughout the car to take it to the next level. Hours were put in searching for just the right part while sweat was poured into combing over the details of the engine swap all to ensure that the car rolled out of the garage looking as if it were rolling off the BMW Showroom. 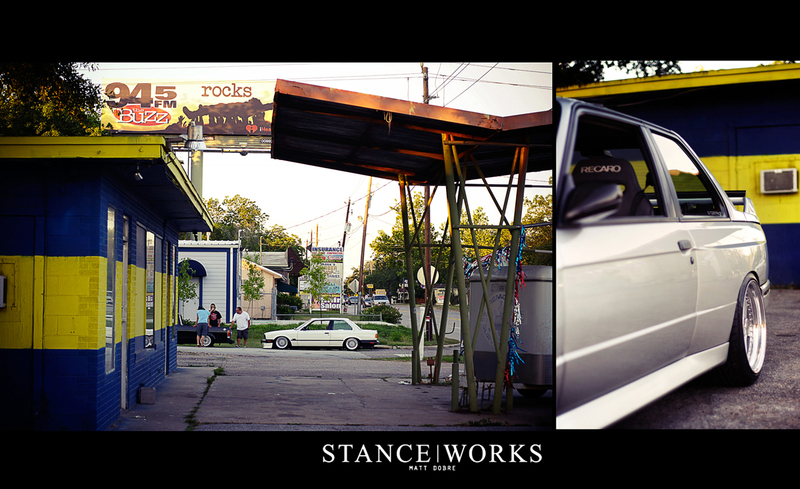 Here at StanceWorks, we respect the amount of planning and time that goes into achieving such a result. 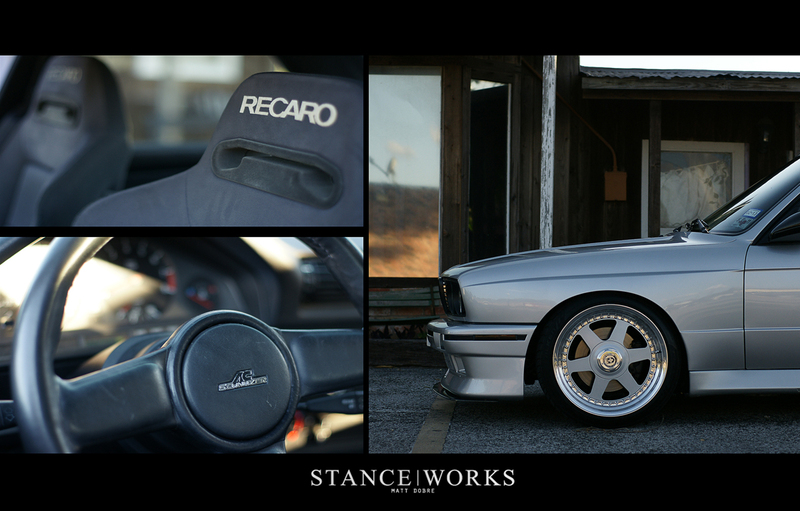 To us, Greg Strube's BMW E30 M3 is a tastefully modified project executed with the care and finesse of an artist. We applaud his work.